The New England Patriots went into a hostile environment that is Ralph Wilson stadium on Sunday and took care of business, beating the Buffalo Bills 40-32. Over the course of the game there are a few plays that factor into the outcome of the game more than others. Here are a few from Sunday's that impacted the game in a huge way. The Patriots were leading 14-7 at this point. 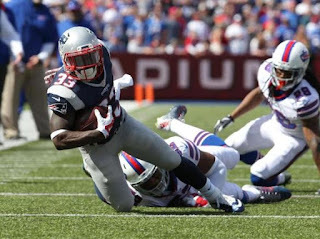 Coming off of a Dion Lewis touchdown run. Moment was very much in the Patriots favor at this point put a drive by the Bills could get them right back into the game. That is until Super Bowl hero Malcolm Butler came up with an interception on an over thrown pass. On the first play of the second quarter, the Bills faced a 3rd and 9 deep in their own territory. Bills quarterback Tyrod Taylor drops back to pass. Taylor's pass goes off the finger tips of intended target Charles Clay. Malcolm Butler was in coverage of another player about 10 yards behind Clay. When the pass goes over Clay's head everyone stops, thinking the pass will fall incomplete. But Butler makes a diving attempt at the ball and is able to scrap it right off the turf to come up with the great interception. Butler's pick sets up the Patriots offense with a short field that they quickly take advantage of with a 5 play touchdown drive giving them a 21-7 lead. Any thought the Bills could continue their ground and pound approach to the game ended with that touchdown. Directly set up by this interception. Backed up deep in their own territory facing 2nd and 20, Tom Brady found Dion Lewis down the sideline for a 40 yard gain. This turned a potential three and out into a drive that produced three points. Maybe this is the play that helps Rex Ryan remember the name Dion Lewis. With :44 seconds left in the first half the Bills are operating their two minute offense trailing 24-13. They have moved the ball onto the Patriots side of the field and have just taken their second time out. The Bills are in a good position. If they gain another 10 yards or so they are in field goal range and maybe even be able to take a couple shots at the end zone. Chandler Jones lines up wide and across from Bills right tackle Cody Glenn. Jones sells to Glenn that his going to make his move to the outside but then quickly jumps inside and is right in Taylor's face. Taylor spins away but its too late and Jones trips him up. Taylor tries to regroup quickly without using their final time out but that would prove costly as he would throw an interception and the next play. Ending the half. With the Bills making a comeback and pulling within 5 points. The Patriots needed a drive that ended in points in a bad way. Brady throws it up to Amendola and he comes up with this insane catch to put the Pats at the Buffalo 19 yard line. Setting them up in prime field goal position and keeping the clock running to help ice the game.